As a student in America, you are fortunate and have access to various resources. This library project is an opportunity for you to make a difference in the lives of your less fortunate counterparts in Africa. You can help by organizing book drives on your campuses. Lives will be changed by your contribution! Email us at Info@RethinkAfrica.org or call (510) 684-9711, and we will help you get started! 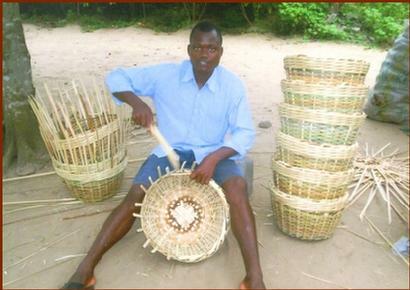 A student weaving baskets to support himself. A library will go a long way in meeting his need for reading materials.